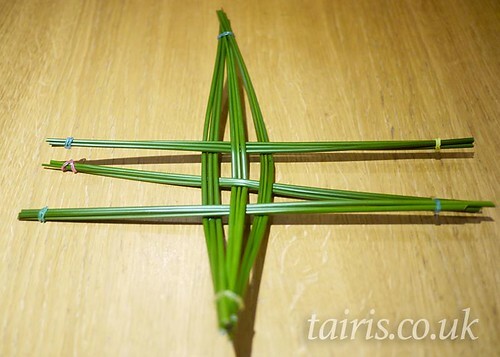 Instructions for how to make the four-armed, three-armed, and diamond or ‘lozenge’ types can be found at the links provided, so here we will concentrate on another kind of cros Bríde, the “interwoven” or “interlaced” cross. 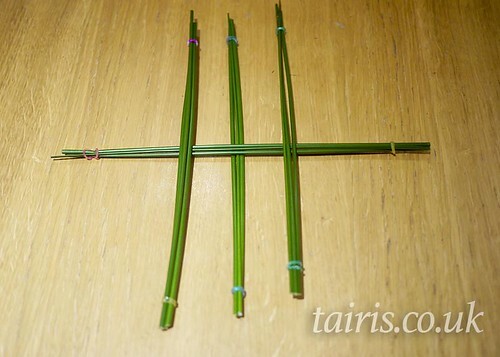 The interlaced crosses can be fairly simple, with only three strands of rushes (or straw) being woven together, or else they can become more complex, with five or more strands on each axis. 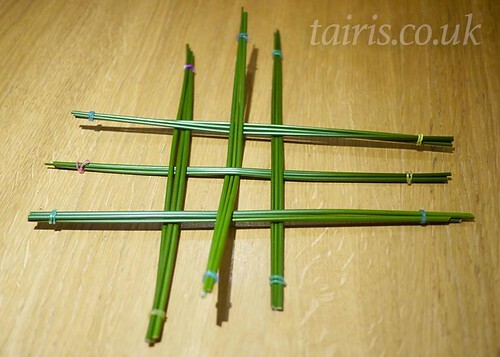 These crosses are most common in Kerry, Cork and Clare in Munster, Sligo and Leitrim in Connacht, Donegal, Derry, Armagh and Monaghan in Ulster, and Laois in Leinster, though O’Sullivan comments that they may have been a relatively recent introduction to Co. Laois as late as the 1940s2 – it just goes to show how the traditions spread, though, doesn’t it? 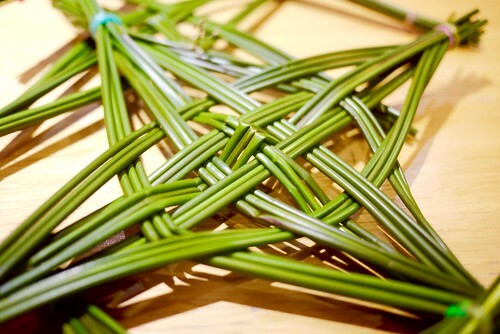 Making this type of cross is a lot easier if you prepare everything beforehand, so collect your materials and cut them to the length you want them; I think it helps to have longer strands if you’re aiming for a more intricately woven cross, to give yourself more wiggle room. As usual, if you want to use straw, you will need to soak them before trying to use them, otherwise they won’t be supple enough to work with. 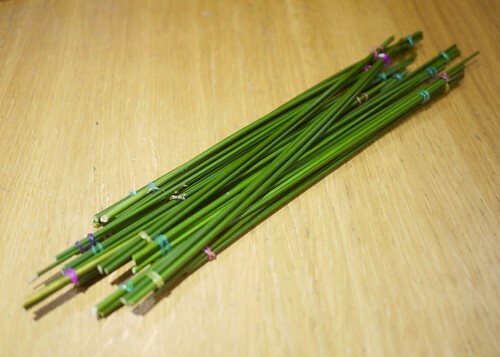 Rushes can be used as soon as you pick them, however. Start by preparing your your rushes (or whatever you might be using). 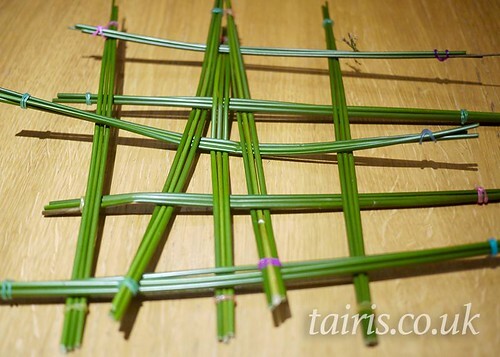 It is much easier if you cut them all to size from the beginning (though you can adjust things later on if need be). Remember, it is traditional that you don’t use scissors or a knife during the process – no iron! So use your finger nails or something that doesn’t contain iron. 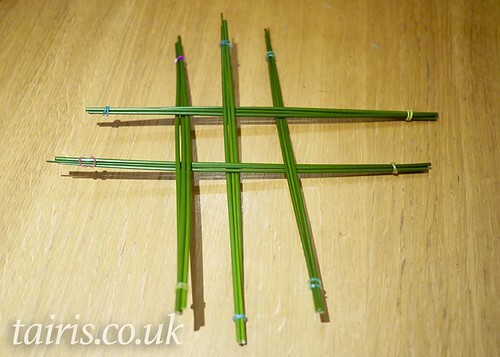 Tip: If you are making a more intricate cross – like the one illustrated above, with additional strands – you will want to make sure that some of your rushes are longer so they can bend a little further as you add them on to the outside edges of the cross. Once you have done that, it’s time to work horizontally. 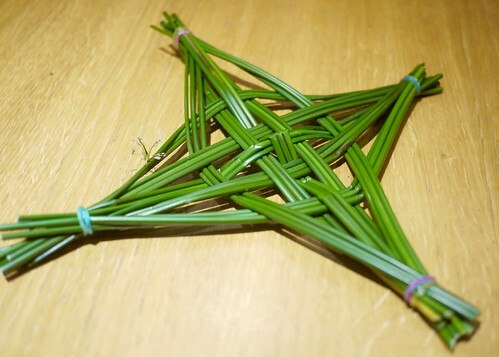 Take another bundle and weave it in across at the top of your cross, going above, below, and above your vertical rushes. 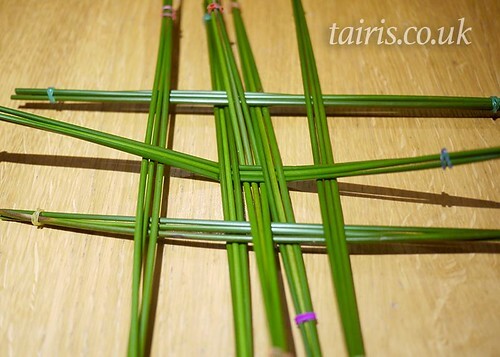 If you want to continue with making a more intricate cross, just keep adding more strands on the top and bottom, left and right, following the same idea as before. You can keep going so long as you have room to work with, though it’s best if you add an equal amount on each side so you don’t end up with a lopsided cross. 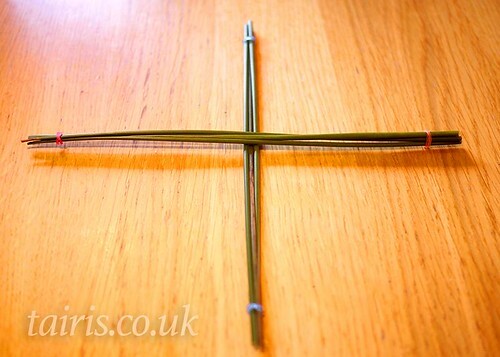 For the more intricate crosses, it helps to keep the spacing of your strands fairly tight and even in the centre as you go (so do as I say not as I do! The spacing shown above is for illustration purposes only…). And you’re done! You can now hang up your cross, or perhaps give it as a gift of friendship to someone who is dear to you. Receiving a cros Bríde as a gift is a great honour and a blessing. 1 O’ Sullivan, ‘St Brigid’s Crosses,’ in Folk Life Volume 11 Issue 1, 1973, p80. 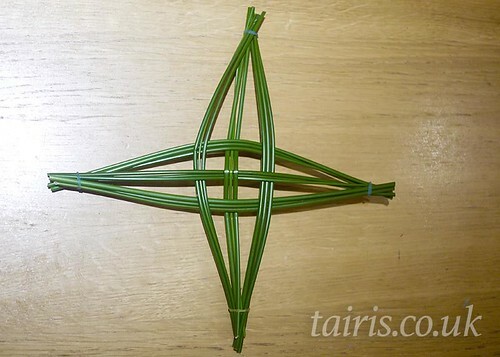 2 O’ Sullivan, ‘St Brigid’s Crosses,’ in Folk Life Volume 11 Issue 1, 1973, p78.